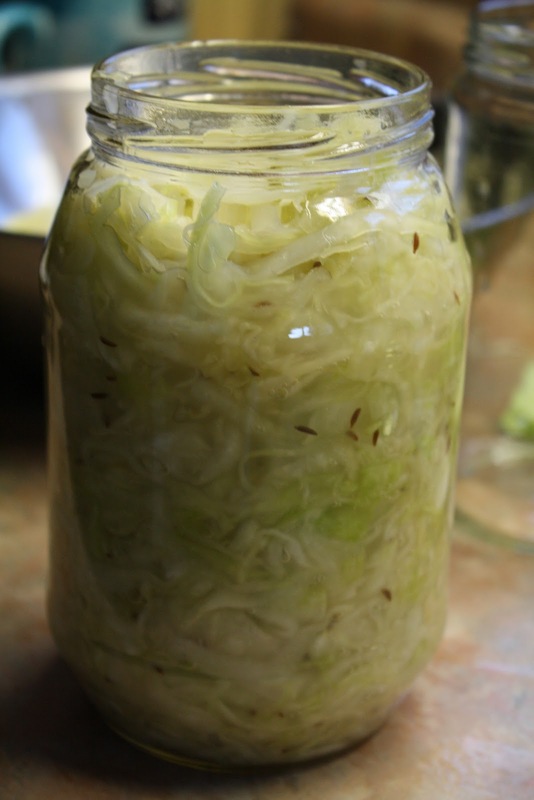 Last month I made a huge batch of one of my favorite foods - sauerkraut! Mmmm, I go through periods of eating a lot of it - sometimes it gets my tummy bubbly (read: gassy) if I haven't had it for a while, but that's just the body adjusting. Unpasteurized sauerkraut and any fermented veggies contain bacteria that is highly beneficial for the gut, aiding in better digestion. While you can add all kinds ingredients to your kraut to flavor it, I prefer mine pretty simple - either plain, with caraway seeds, or dill. In the past I've made it with dill and garlic which is also nice. 1. Remove the outer leaves of the cabbage and thinly slice it with a knife or in a food processor. 2. Toss the cabbage and salt together in a large bowl. The salt draws water out of the cabbage, creating a brine, and also preserves it during the fermenting process. I added caraway seeds at this point. 3. Massage the cabbage, speeding up the release of water, and/or place a plate with a weight (rock, or jar filled with water) on top until you notice the liquid. I like to massage it and then let it sit with a weight for 20- 30 minutes. A good amount of liquid should be release before moving on. 4. Add herbs/spices of your choice, and/or other veggies and toss together. 5. Spoon the mixture into glass jars and then firmly press the kraut down (I use a wooden dough press) to release all air bubbles, and to bring up liquid level. The liquid must rise above the cabbage. 6. I like to press the extra cabbage leaves on top, to hold the mixture down. 7. Screw the lids on and set the jars in a neutral temperature for a few days. Check after 3 days and then store in the fridge, or ferment for a few more days. I usually ferment an old large pickle jar for 6-7 days. It will continue to ferment as it's left out, and will stop once refrigerated. Note: Sometimes a layer of mold will form on top of the kraut. Apparently it's still safe after skimming this top layer off, however I did have a jar go bad once and threw it out. I hope you'll try a batch now that you see how easy it is to prepare. Have a happy weekend! thanks for the insight. ive failed at making kraut twice now, but i really want to redeem myself:) i will be following your steps! Thanks for sharing this! I adore kraut, especially living up here in the north and wanting to preserve garden produce for the winter. I krauted a bunch of stuff this summer: unfortunately, quite a bit of it (kale and beet greens) went bad in the fridge. Have you heard it said that cabbage and cucumber have the requisite molds naturally to make the fermentation happen but that other veggies don't? I think I read that somewhere. I often add probiotic capsules to help them along. I had no idea kraut was so easy to make! I thought you needed a fancy caulk or something. But quick question--does it smell? I have roommates that I don't want to tick off, haha. Freshman - I have noticed a bit of smell in the past when I had a HUGE jar of it fermenting in a small room, however, in a large open space where I usually ferment it, I don't ever smell it. I have had this same problem too! I was always deterred by the smell all though I have always been curious to try to make kraut. Maybe with your instructions, now's the time. MY favourite kraut recipe has the cabbage and salt, but I put in dried chives and dill weed as my flavourings. Makes AMAZING kraut! And, yeah, I sometimes get a smell, but I throw a towel over it and put it on a top shelf and I don't smell it. Hint: adding garlic and onions to a kraut will make it smell 20 billion times worse! EWWWW! Just the thought of Sauerkraut makes me druel, it's one of those things, I would rather have that than chocolate! And Im mad on cacao. I love mine with Juniper Seeds! I tried making my own last time but it went bad I dont just massage mine I crushed it with the end of a rolling pin. Now that I know you can have a layer of mould I may try it again. Omg, I need this food now. My 4 year old is addicted to Bubbies kraut--I really need to make my own, more cost effective!! Unfortunately Im not an expert on kraut. I also depends how big your jar is. Bigger jar will take longer to ferment. You want to wait until its a bit tangy... but its also preference. Ive had a friends homemade kraut that was very fermented and sour. Normally I like mine mid range - if that makes any sense, lol. Hi. When you say screw on the lid, do you just use a regular jar lid or a special lid for the fermentation? Sorry for my late reply, I didn't see your comment until now. Prob way to late but for someone's future reference I just used a regular lid for the jar.